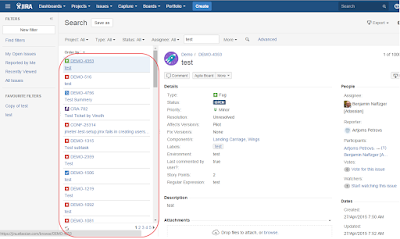 JIRA Issue tracking software provides much better functionality for filtering too. We will learn this in this article. It will display you particular data whatever you needed. If you have thousand of bugs, hundreds of software project still you can easily find what you want perfectly. If we have posted issues on earlier days of the project and you need it in middle of the software project then you can find it by searching functionality. If you want to Change or Edit the issue then you can do it and again save it. Click on 'Issue' and select 'Open My Issue'. It will display you the issues which have been posted by you. After wards you can able to see below screen where you can see list of issues. We just completed one step for finding our issues. Now you can see different options on the left hand dashboard. 'My Open Issue’,’ Reported by me', 'Recently Viewed’,’ All Issues' this are the option for filtering issues of software project. 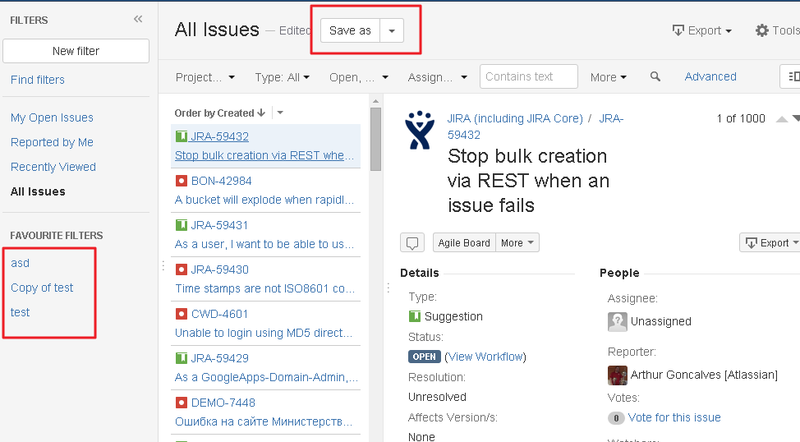 If you will click on 'Reported by me' option then JIRA will display all the issues which have been reported by you. In 'Recently Viewed' option you can find the issue which has been reviewed recently. 'All Issues' button displays all the posted issues. Below Image displays another way to search your issue. Here you can able to see different fields with drop down menu. As shown in figure, we can search issues by selecting particular software project. For example, you are having more than 10 project and you want to find an issue which have been posted a long time ago. Now you need to just select that project from drop down menu. Once you click on project then it will display you drop down menu from where you can select your software project and find an issue for it. Same way you can find issue by selecting Issue Type. See the below image. Here you can see that, we can search by one issue type and more than one issue type. For Example, if you want to search issue which have issue type as ‘Bug’ then select Type as Bug and click on search button. 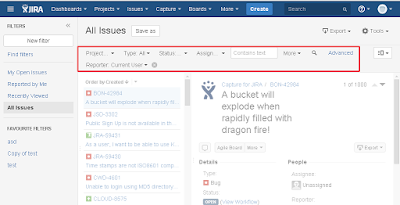 JIRA will displayed you all the Bug type Issues. In this image you can see that, Issues can be finding by status also. If you want to find issues by its status then you can find it from here. For example if developer want to verify that how many issues are still in ‘ÓPEN’ status then he just needs to select ‘OPEN’ status from the status drop down. 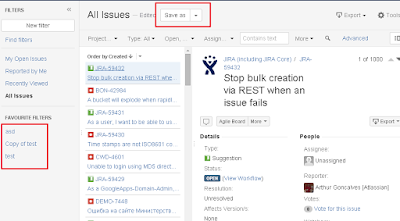 Then JIRA will display all the issues which have Open status. Here you can verify issues by more than one filter, like select Project first and then select Issue Type and Status after wards click on search button. 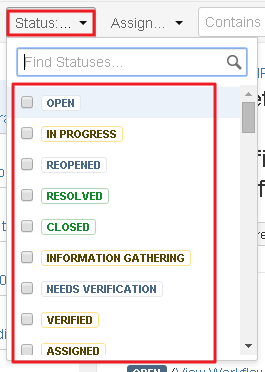 Thus, JIRA will display you proper result for particular project’s issues with selected issue type and status. You can search issues by selecting assigned person also. 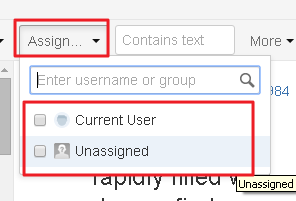 For Example if you want to find issues which have been assigned to a group or a person then you can do it from here. You can search issues by its text. Enter text on search field and click on search button. 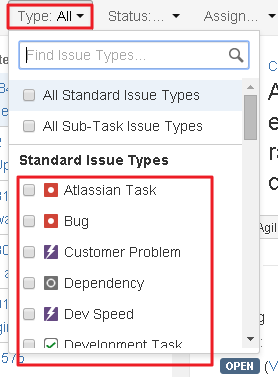 After wards JIRA will display you all the issues which will related to this context. 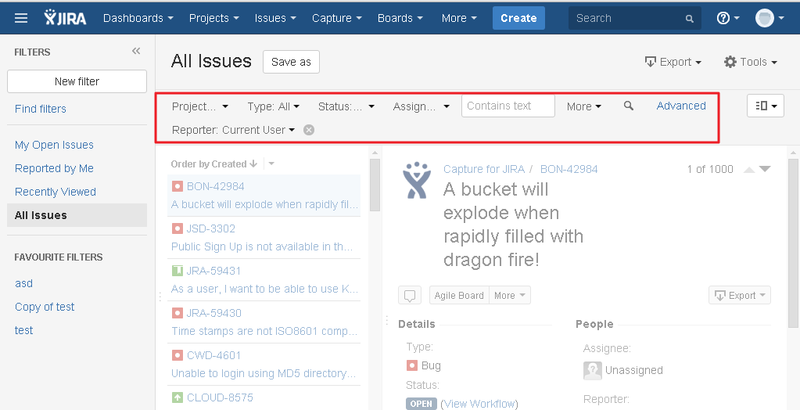 This all Filter can be managed by JIRA project management software too. By clicking on ‘Save as’ button you can create new filter. After creating filter, you can save your filtered issues in it. 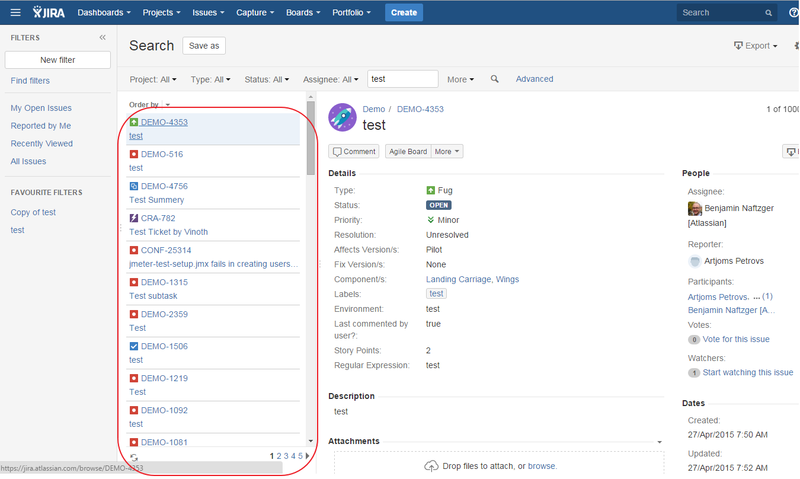 This is the key feature of JIRA. As per the image you can see the favorite Filters on left hand side. This has been created for saving needed issues. You can Delete this filter and Edit it. Go to ‘Issues’ from main screen and then select ‘Manage Filters’. You can see below screen here. You can see here, all the filters have been managed here. You can Delete and edit it. Even if you will have more filters then you can search it from here also. You can verify issues from ‘Issues Navigator’ from profile tab. This is the whole procedure how you can filter all the issues and manage it accordingly.